Hike, bike, raft or tour Canyonlands and Arches National Parks from your Neighborhood Suite home base. On Nichols Lane, a quiet residential street just four blocks from downtown. 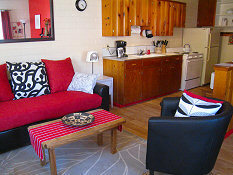 We have fully equipped kitchens, fun patio furniture, hot tub and more! At this nearby musical park or at our National Parks. 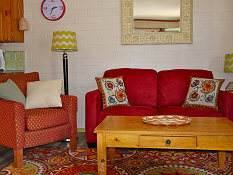 Escape the bustle of Main Street and make our Suites your home base in Moab. You’ll find us on Nichols Lane, a quiet residential street just four blocks from downtown. 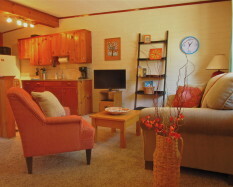 Each suite has a fully equipped kitchen, a separate bedroom with a queen bed, and a wonderfully inviting living space. Picture coming home to your new neighborhood following a hike in Arches or an afternoon ride on the Captain Ahab trail. Take a moment to relax on the couch, fire up the bbq for an outdoor dinner, or soak in our hot tub. Stay as long as you’d like! M: Cozy and welcoming, our southern corner suite is full of bold color. O: Plenty of room to relax after a day on the trail! B: Black, white and red combine for a fun retro-modern style.